Scientists have known for many years that human beings, as a general rule, are an overly optimistic bunch. We close our eyes to statistics suggesting our eating habits may be killing us, ignore warnings about texting while driving and almost always believe things will come out all right in the end if we'll just hang in there, despite sometimes obvious indications to the contrary. Research has suggested that two specific symmetrically opposite parts of the brain influence our optimism or pessimism, but until now haven't been able to offer direct proof. Now however, new research by a group of neuroscientists has found, as they describe in their paper published in the Proceedings of the National Academy of Sciences, that turning off one of these areas via magnetic pulses dramatically reduces overly optimistic tendencies. (A) In each trial participants were presented with a short description of one of 40 adverse life events and asked to estimate how likely this event was to occur to them. They were then presented with the average probability of that event occurring to a person living in the same sociocultural environment. The second session was the same as the first session, except that the average probability of the event to occur was not presented again. (B and C) Examples of trials for which the participant’s estimate was (B) higher or (C) lower than the average probability. 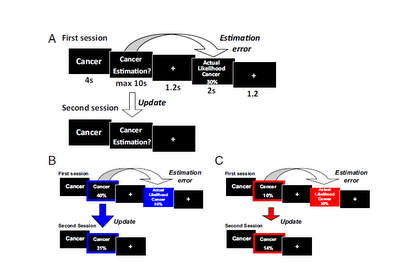 Here, for illustration purposes only, the blue and red frames denote the participant’s response (either an overestimation or underestimation, respectively) and the blue and red filled boxes denote information that calls for an adjustment in a (B) favorable (good news) or (C) unfavorable (bad news) direction.